The Virginia State Bar Criminal Law Section has presented its 2015 Harry L. Carrico Professionalism Award to The Honorable Jerrauld C. Jones of the Circuit Court of the City of Norfolk. 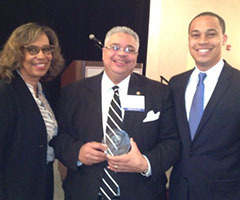 Virginia State Bar President Kevin E. Martingayle presented the award Friday, February 13, 2015, during the section’s 45th Annual Criminal Law Seminar in Williamsburg. The award was named for the former Virginia Supreme Court chief justice who promoted the ideals of professionalism during his forty-two years on the state’s highest court. Jones was appointed to the Norfolk Juvenile and Domestic Relations Court in 2005 by Governor Timothy M. Kaine. The governor appointed him to the circuit court in 2008 and the General Assembly elected him to a full eight-year term in 2009. Jones was elected to the Virginia House of Delegates from the 89th District and was re-elected eight times. He was a member of the House Rules Committee. Jones earned his bachelor’s degree from Princeton University in 1976 and his law degree from the Washington and Lee University School of Law in 1980. He served as the first African-American law clerk to the Supreme Court of Virginia. He later returned to Norfolk and served as an assistant commonwealth’s attorney before opening his private law practice. He stayed in private practice until 2002 when Governor Mark Warner appointed him state director of juvenile justice. He also served on the State Advisory Group on Juvenile Justice and the Governor’s Advisory Committee on Juvenile Justice. Pictured above, The Honorable Jerrauld C. Jones (middle), his wife, Lynn Simons Jones (left), and their son, Jerrauld “Jay” Jones (right).